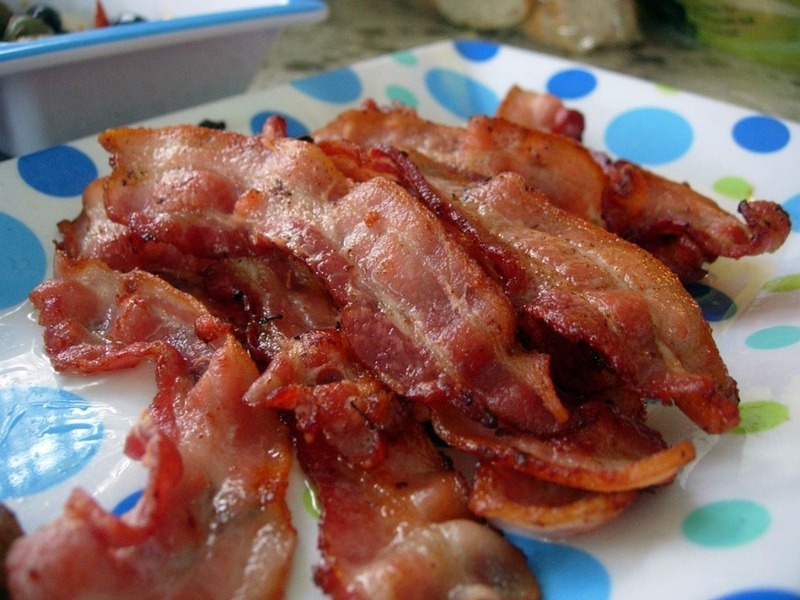 Mmm, delicious bacon. Photo by wEnDy on Flickr. The bacon butty has to be one of the UK's all-time greatest hit sandwiches. Fluffy white bread stuffed with bacon, its fat still sizzling, topped with your choice of sauce (brown). It’s hard to beat. 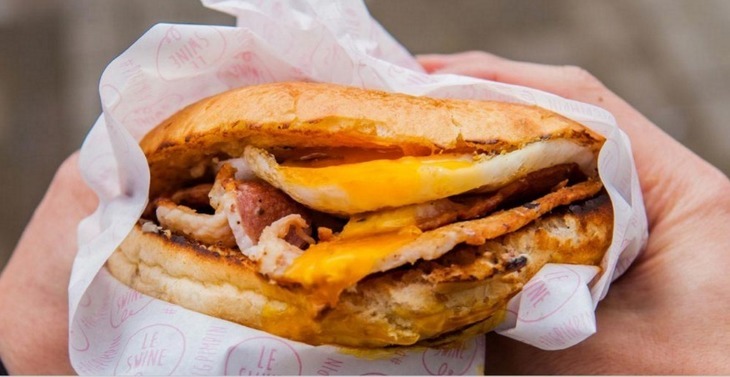 Here's our list of the best bacon sandwiches in London, from the classic to those that just about qualify as a sandwich. We like to play fast and loose with the rules because, well, it's just a lot more fun, isn't it? Head to south London's Brockley Market to catch this one from street food trader Cristiano at Tongue n Cheek. His sandwich is made with as many south London sourced ingredients as possible, so that means sourdough from Little Bread Pedlar and smoked streaky bacon from Nathan Mills of The Butchery. There's also griddled tomatoes with oregano, crispy gem lettuce, and kewpie mayo (Japanese sweetened mayo), making it one helluva BLT. Add a Fosse Meadows egg to make it a BELT. You'll need to loosen yours after eating it, that's for sure. Look, you're going to have to get up early to try this one, and we mean really early. Get to Billingsgate at 4.30am-5am-ish to catch this surf 'n' turf arrangement which is great value at around the £3 mark and fuels a market full of hungry traders. Scallops are whisked in from the market floor, released from their shells and onto the grill before finding their final resting place in a bap with bacon and some pan drippings. Perfect. 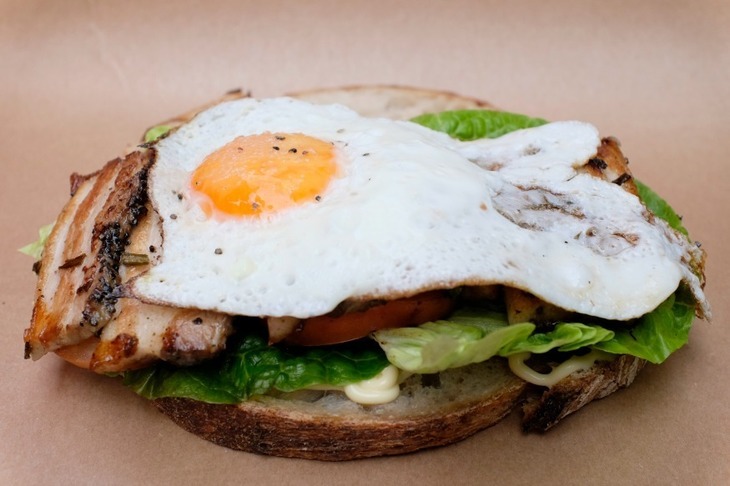 If you can’t face the alarm clock then you can get a scallop and bacon sandwich from What The Dickens! (really though, every Londoner should experience the original, and the market, at least once). This is far from traditional but it's very fun. A little round bun is filled with chopped bacon then sealed completely, a bit like a dumpling. They’re only available on Sundays for it would be dangerous to have such a fulfilling food item in one's life more often than once a week. That way lies certain ruin. Served with a dollop of… what's that? Ketchup?! If you sell yourself as 'the best bacon butty in London' then it had darn well better be good. It's the thick bacon that really makes this special — almost reminiscent of a gammon steak. The devil is in the detail all round really, from the toasted milk and onion bap (be still our beating hearts) to the bacon butter (BACON. BUTTER), to the… oh, it's mushroom and tomato ketchup. Fine. We understand some people like that kind of thing (#brownsauceforever). Bacon in a bun from Le Swine. Here topped with egg. Bit of a cheat this one since it's a spring onion pancake, but we laugh in the face of rules and anyway, it feels more like a flatbread crossed with a pancake. Inside, there's bacon, obviously, plus an oozy egg for good measure. Many would consider this a knife and fork job but to not at least try picking this up is to be defeatist, and quitters do not eat bacon sandwiches. They eat granola. For a similarly messy and interesting take on the bacon sandwich try the now infamous (in London, anyway) bacon naan at Dishoom. The Lido Café is a rather tranquil spot to scarf a bacon bun, very appropriate for those feeling a little worse for wear in south London. 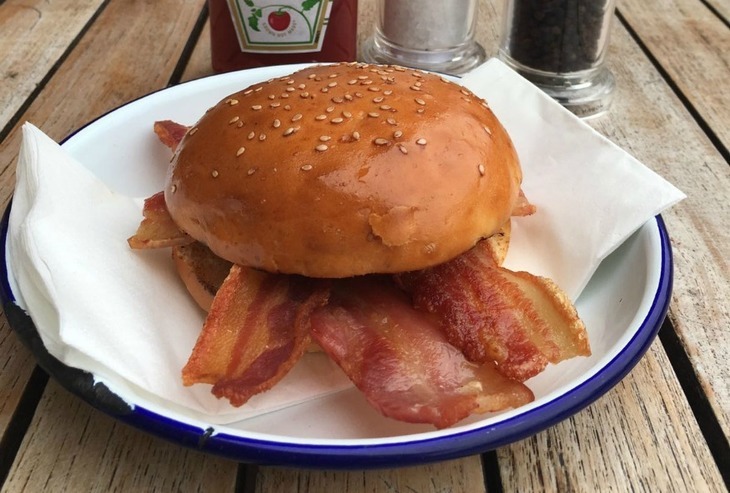 A buttered brioche bun is filled with unsmoked, Gloucester Old Spot streaky bacon, the extra fat ensuring lots of crispness and the delicous fat seeping into the bun. The brioche bap at The Lido Cafe. The Lido Cafe are very proud of the bacon inside their buns and have spent a long time getting it right saying, "we really do believe that rare breed pigs make a difference, we prefer Middlewhite for pork cuts. Tamworth might be a bit strong and gamey for some, but Old Spot pigs make great bacon. It is on just the right side of piggy." Kebab peddling rockers Black Axe Mangal also make a killer BLT that not many people know about. What started out as a temporary feature on the menu became permanent when people just couldn't get enough of their bacon in flatbread. 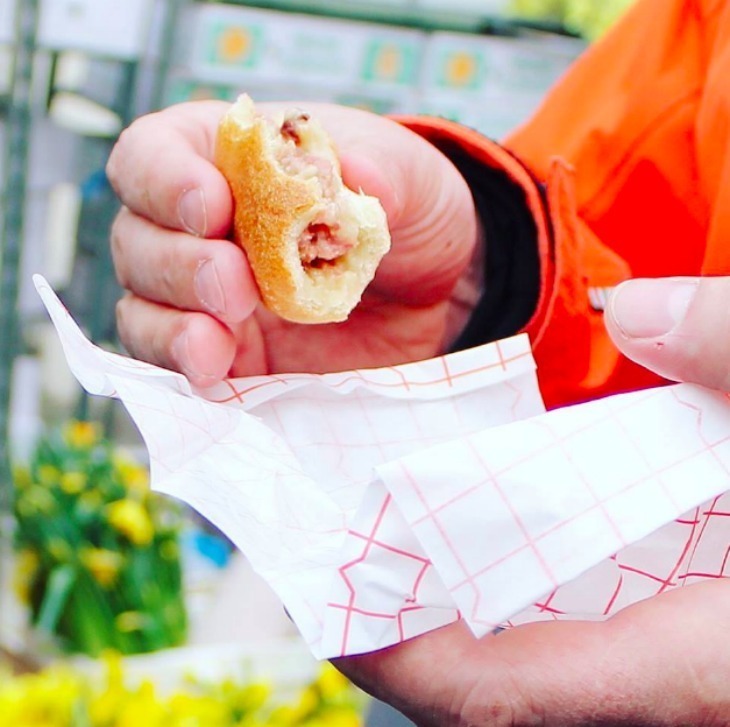 We asked chef and owner Lee Tiernan how it came to be and he told us, "our friend and main supplier Farmer Tom cured a small side of pork and made it into bacon. He gave us a bag on him. We grilled the bacon before service on a Friday night and knew it was an amazing product. It's about 80% fat. Something we openly encourage here at BAM. More fat the better. As we had some fantastic bulls' heart tomatoes in the house so it seemed only fitting to put it on as a BLT. We make the flatbread to order. Slather it in butter. Grill the bacon and rest it on the bread. Super greasy. Add slices of tomato with a little black chilli, aioli dressed romaine lettuce and a smattering of pickled red onion.